While growing up, we all remember our parents reminding us to look both ways before we cross the street. However, many parents often times seem to forget this reminder while crossing an intersection. As a general rule, it is imperative to always use the crosswalk, and only enter said crosswalk once you have been instructed to do so by the traffic device or licensed authority, while always making sure to “look both ways”. Statistically, pedestrian vs. motor vehicle accidents result in death more than 70% of the time. Those who cross prior to the signal or try and play chicken without using the designated crosswalk often do not have a case, unless speeding or failure to drive without lights-on played a role. Many pedestrians’ cases occur at night when drivers often misjudge speeds, have impaired depth perception or simply cannot see the pedestrian. 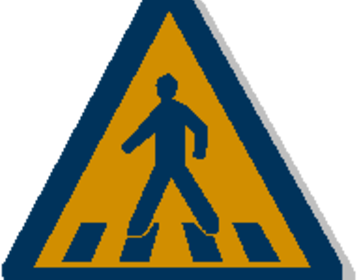 Crosswalk accidents occur very frequently in Nevada given the shear volume of pedestrians who frequent the Las Vegas Strip and Downtown Reno. Crosswalks are very dangerous given that oncoming traffic may or may not realize a crosswalk is present, nor the pedestrians who may be in the crosswalk. Crosswalks rely on the pedestrian to walk when the time is appropriate. The red stop walk sign is followed by the white hand stating it is OK to walk. Pedestrians often will be walking before the official countdown occurs until the No walk sign is posted. Those who risk the timing of the light, also risk their life as oncoming motorists may just time the light as well and tragedy can strike. Nevada crosswalks should have better illumination for those drivers, as the white lines are only good for those walking. Pedestrian are killed at intersections and sidewalks when traffic merges into the walking lane. Sidewalks were intended for pedestrian traffic and unfortunately not much protection is allotted for those who use the sidewalks. Children in particular can be victims of distracted or intoxicated drivers who merge over the curbs and onto our sidewalks. Jaywalking or walking without the right to do so, is a citation commonly given in pedestrian accidents when a person is hit in a crosswalk, but may not have had the right to do so; hence the motorist is given the right of way. These accidents are horrific for the party walking whom are not only cited for jaywalking but also severely injured. Our law firm will look at the facts and circumstances surrounding the jaywalking citation and see whether liability may exist against the driver. We have represented many individuals whom have made it through a crosswalk and been hit as they nearly made it to the other side. Speed is also a huge factor to be considered when evaluating fault in a crosswalk accident. Those pedestrians who flat jaywalk in an unmarked crosswalk or street really take a huge risk when attempting to maneuver across the street. The Las Vegas street of Boulder Highway is frequently in the news given the long stretches of roadway without a crosswalk, making it quite unreasonable for those wishing to walk across the street. This unfortunately increases the risk for those who may be handicapped or not as fast when walking, as the long road is not often taken. The world famous Fremont Street experience (formerly just Fremont Street) abounded with car and foot traffic and still does today. The "Fremont Street Experience" closed down Fremont Street to automotive traffic so that all could use Fremont to navigate the hotels and casinos. 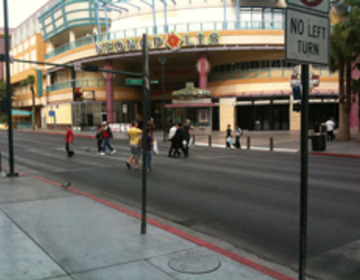 Unfortunately, Fremont Street has become a nightmare for pedestrians who may not know when the pedestrian area ends. Up 4th street it is a ONE-WAY only street, but it directly intersects with Fremont and the pedestrian traffic bottlenecks. Pedestrians are often victims of car accident cases in residential neighborhoods. Children can be victims of cars that speed or drive recklessly. Speed limits in neighborhoods are usually 25 mph or less. Vehicles that exceed the speed limit have a much tougher time stopping for children, bicycles, and others whom may be playing in the area. Malls, hotels, Walmarts and other commercial centers have huge parking lots with lots of parking lot or garage accidents. Because the area is a private property, the commercial parking lots are rarely visited by police to make accident reports; consequently many accidents go unreported. This should not be the case. If you are involved in a parking lot accident you are still allowed to file a police report with the local police substation. It is imperative that the party involved obtain the insurance information and description of the opposing driver. A license plate is excellent information to obtain. 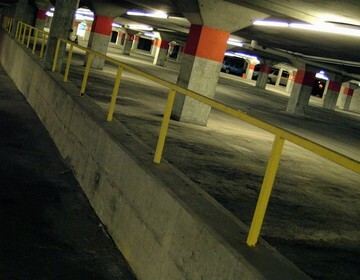 Commercial parking lots are prone for pedestrian accidents given the geography and layout of the parking spaces. Pedestrians often get lost or walk through alleyways to get to the next row of parked vehicles. Speeding cars will not stop in time and catastrophe can strike. Pedestrians, taxi's and other motion objects are constantly moving about the airport arrival and departure areas of the airport. Consequently, the amount of people who are in a hurry to exit, get to their plane, and rush to explore Las Vegas and Reno is enormous. Increasing the risk is the rush: the rush to not miss a plane, the rush to get their luggage, and the rush of taxi drivers. McCarron International Airport is home to over 30 million passengers every year and that number is expected to increase annually. Las Vegas' newest attraction is airport terminal 3 which is going to increase the visitor traffic tremendously. To the north, Reno-Tahoe International Airport average over four million passengers a year and continues to grow. In choosing a personal injury attorney, experience is crucial, and understanding the intricacies of pedestrian accident law is key. At Benson & Bingham we work with quality experts to ensure your claim is protected. Call one of our Las Vegas, Henderson or Summerlin locations or our Reno law office today and speak with a qualified pedestrian injury attorney: (702) 382-9797.